While on our way to Gozo a few weeks ago we passed by Popeye's Village. We've never been to it - we don't have kids, so we lack a good excuse - but it sure is something to look at. I think those are the only wooden buildings on the whole island (no joke). Popeye's Village is quite popular among holiday makers, particularly families, particularly during the summer months. 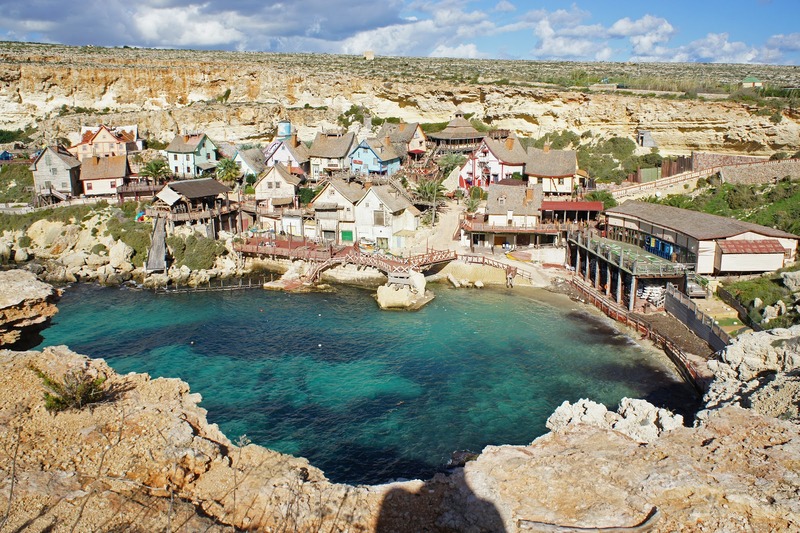 It offers movie set tours, a Popeye comic book museum, mini golf, water sports and trampolines, sea access, play pools, puppet shows, video games, and free wine for the adults. (That last bit is key). Mike once got his hands on the Popeye (1980) movie. He watched ten minutes of it, couldn't understand a thing Robin Williams was saying, and gave up. Are you old enough to remember it? How strange to find its set here, on a little island in the middle of the Med, still attracting visitors nearly a quarter of a century later. Ha! This is SO cool... 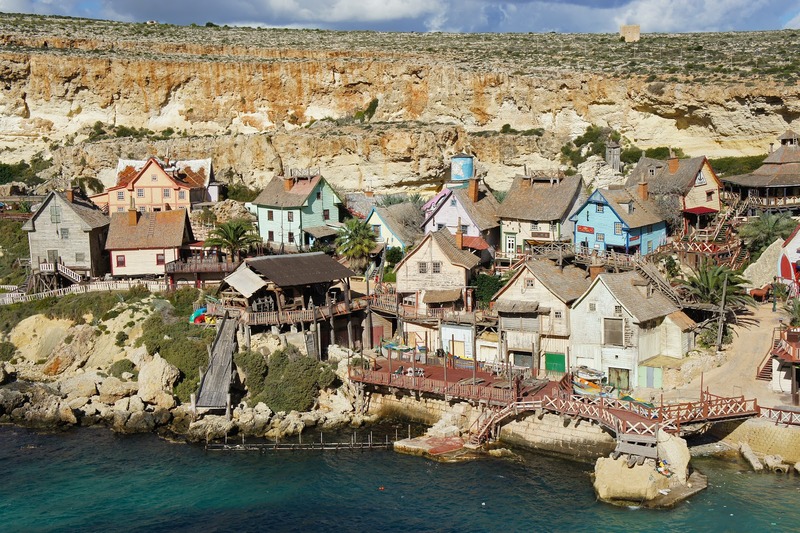 I had no idea that Popeye was filmed in Malta :) Looks like such a little oasis! 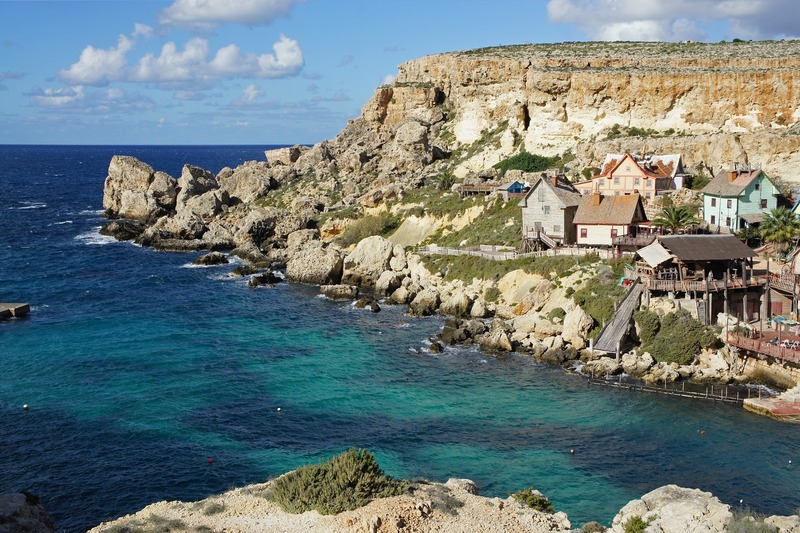 I also had no idea that Popeye was filmed in Malta?! I'm not sure I ever watched the movie - perhaps when I was really young but I certainly don't remember it! Lots of movies are! It often doubles for ancient civilizations, the Middle East, etc because it's safe and cheap. Alexander, the Gladiator, bits of the Da Vinci Code, Munich, Troy...it's a long list. Such a cute little village. I don't think I ever watched Popeye the movie. Guess I wasn't missing out?! OMG it's soooo beautiful! I want to go swimming in that lake!!! I loved both the film and the set when I was younger! Half the fun of the film was recognising the buildings on the set, and half the fun of visiting the set was re-enacting the film. I guess it was a cycle!